The first toothpaste tubes, appearing on the scene in the 1890s, originally were made entirely of metal. In the 1940s, because of metal shortages during World War II, they were constructed of a mix of plastic and metal. A hundred years after their invention, toothpaste tubes became completely manufactured of plastic as we know them today. A Connecticut dentist named Dr. Washington Sheffield introduced collapsible metal toothpaste tubes in 1892. Such a container, he reasoned, was both convenient and sanitary. All one needed to do would be to squeeze out the desired amount of paste and, as the contents were used, the tube could be rolled up. The airtight tube also would keep the paste from drying out. The dentist had begun using toothpaste in his practice in the 1850s, and started selling his Dr. Sheffield’s Creme Dentifrice commercially in the 1870s after continued praise from his clients. 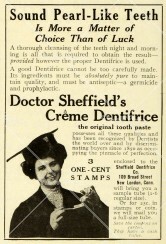 Dr. Sheffield’s Creme Dentifrice was an immediate success. Collapsible tube packaging lowered the price of toothpaste and spawned the U.S. dentifrice industry that now accounts for $150 million annually in retail sales. It provided the collapsible squeeze tube industry, then on the American scene a little more than a score of years, with the impetus it needed to lift it out of the packaging doldrums. Sheffield was also the likely inventor of toothpaste, although the Colgate Company makes claims to this achievement too. Both his company and Colgate had been selling their toothpaste in jars, and when Colgate switched to tubes, they called their new product Colgate Ribbon Dental Creme. In Great Britain around the same time, Beecham’s Toothpaste also began to be sold in collapsible tubes. Before toothpaste, people had commonly been using tooth powders for teeth cleansing. Sheffield got the idea for the tube from his son, who had traveled to Paris and saw artists using oil paint from metal tubes. The first toothpaste tubes were made of tin and lead, and remained basically the same until a metal shortage during World War II. The War Production Board restricted consumer use of many types of metal, including tin, lead and aluminum, creating a potential crisis in the toothpaste tube industry. Aluminum industry leaders received approval for a salvage depot idea where consumers could buy a new tube product if they turned in some sort of used metal product. During the war, manufacturers began creating toothpaste tubes from aluminum and plastic while most of the tin and lead supply went for military usage. Advancements in synthetic detergents made after WW II allowed for the replacement of the soap used in toothpaste with emulsifying agents such as Sodium Lauryl Sulphate and Sodium Ricinoleate. A few years later, Colgate started to add fluoride to toothpaste. Manufacturers were making tubes made completely of plastic by the 1950s for suntan lotion, but this type of polyethylene tube did not work for toothpaste, as it was too porous and reacted with toothpaste ingredients. Eventually all-plastic toothpaste tubes were introduced in the 1990s and rapidly replaced the plastic-aluminum combination. Plastic tubes have one distinct functional advantage over metal tubes–metal tubes are much more likely than plastic ones to tear or get a hole in them when rolled up. The toothpaste comes out of the perforations, which is a messy business. The paste also can then become dry from air getting into the tube. Metal tubes do have some advantages over plastic tubes. They stay coiled up from the bottom better, and because of this, they are less likely to draw air back inside because the paste stays put at the top opening. This is because metal tubes did not have the “memory” that plastic tubes have. Memory is a characteristic of materials that is related to resilience. A material with memory will, after stress has been relieved, tend to restore itself to a configuration the material was in before the stress was applied. A plastic tube if coiled will tend to uncoil; a metal foil tube will much more readily remain coiled. For reasons of economy, many people prefer to exhaust the supply of toothpaste in a tube before discarding it. Removing the toothpaste from a plastic tube is, to some extent, much easier than removing the toothpaste from a metal foil tube because the plastic tube can be subjected to squeezing without concern for perforations and tearing. But after squeezing the tube from the bottom end to the cap, the tube should be coiled to prevent the toothpaste from migrating away from the cap end of the tube. However, the tendency of a plastic tube to uncoil and straighten enables the toothpaste to migrate; a straightened tube encourages some people to squeeze the tube from the middle or top, near the cap, rather than from the bottom where they should if they want to force the toothpaste in the tube toward the cap. Metal tubes are still commonly used for oil paint and certain gels containing pharmaceutical products and supplements, to keep air from getting in at the top. Air can dry out the product, or it can cause oxidation that may result in some degradation. This entry was posted in Oral Care, Toothpaste and tagged aluminium, Beecham's toothpaste, colgate, colgate ribbon dental creme, collapsible squeeze tube, Dr. Sheffield's Creme Dentifrice, plastic, tin lead, toothpaste tube, Washington Sheffield on September 18, 2011 by chzechze.